High Strangeness: More UFO Lies and Scandals! Something potentially very, very weird has come up in regards to my research on the J. Allen Hynek biography, and even though I can't at this point go into great detail or name names, I can't not write about it!! Someone recently contacted me about the book, and offered to share stories and recollections of Dr. Hynek. Naturally, I accepted the offer, and we set up a time to talk. The interview was very enjoyable and informative, and I learned a few interesting things about the good Doctor that I had not heard before. And then things got weird. This source started telling me a story that involved the personal lives of certain people central to Hynek's life. It was unpleasant stuff, to be sure, and even though the source said it was true, there was no proof offered. Nor was I given the names of anyone still alive who could corroborate the story. I have done what little I can do to look into the story, and so far I have found nothing that would verify what this source told me. To look any further than I already have could very possibly hurt and offend people for whom I have a great deal of respect, so... I'm just not going to go any further. Could it be that I'm some sort of "human polygraph"? So, I am left with this very odd story that magically fell into my lap that cannot be easily verified (but that, in truth, doesn't really have a whole lot of relevance to the story I'm telling in my book). And I have to wonder if someone is trying to set me up. Knowing what I know about some of the characters who live in UFO world, and how threatened some of them seem to be by perceived challeneges to their sacred turf, I don't think it's all that ridiculous to think that somebody might try to feed me false information in the hopes that I'd put it in the book and destroy my own credibility. Because here's the thing: when this person started to tell me this story I detected a change in the person's voice. I guess this is stuff that a polygraph picks up on... if I had to describe it I would say that the voice started to exhibit elevated stress levels. The pitch rose... the cadence changed... the person's intense discomfort was palpable. As I was listening to the curious changes in the voice on the phone, my first thought was that the person was simply feeling fear and anxiety over sharing such a damaging story that no one else, to the best of my knowledge, has ever made public. That would make anyone feel stressed and unsure. You came up with the solution yourself. If you speak to this person again, ask them if they would be willing to take a polygraph test. Tell them that the nature of their story would be so sensitive and if you included it in your book, you would have to be sure. They will either refuse and give you whatever excuses or if you are lucky they just might accept. You might be able to tell from their tone of voice whether they are BSing or not. Remember that old reporter's adage: "When in doubt, leave it out." If it can't be satisfactorily verified by independent sources, don't use it. This sounds like a bit of a real dilemma. You have a source who tells you "a story that involved the personal lives of certain people central to Hynek's life. It was unpleasant stuff, to be sure, and even though the source said it was true, there was no proof offered." But, on the other hand, you say this unverified (and perhaps unverifiable) info "doesn't really have a whole lot of relevance to the story I'm telling in my book." And, because from what little you were able to look into with such minimal sourcing (or reference to anyone else your source might have been able to provide to vet the story with at least one "second source"), you "have found nothing that would verify what this source told me," and also note "to look any further than I already have could very possibly hurt and offend people for whom I have a great deal of respect," and thus seemingly conclude that "so... I'm just not going to go any further." But then, you blog about it, and even though you can't give us any details other than it relates to certain people close to Hynek, and that the story is "unpleasant stuff," nonetheless this posting about your experience at least suggests you're wondering what others reading this might either think, for feedback, or be able to recommend regarding this rather sticky wicket. First, I wouldn't suggest what "Anonymous," above, mentions. Asking someone to take a polygraph test in a case like this would be perceived by most being asked as excessive and as strong evidence you think they are probably lying. Most would then refuse to take a polygraph. And that has nothing to do with whether the story itself is true or not. 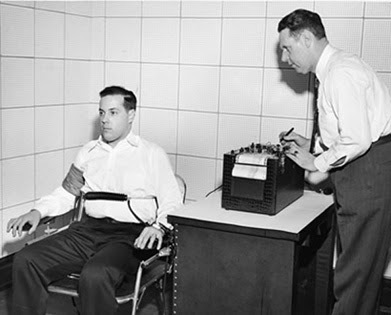 Polygraphs essentially measure variances in bodily functions (blood pressure, breathing rate, etc. ), not truth or lies per se. They are also highly subjective in relation to the training, length of experience, and potential biases of the polygrapher used to administer a test. See https://antipolygraph.org/ for a plethora of reasons why these tests are both inherently unreliable and not scientifically based, and why the results are not admissible in court. Second, do you know anyone who knows your source? Maybe you could ask them what they think of your source's general objectivity, bias, or truthfulness regarding his relationship to Hynek without broaching the source's particular "unpleasant" story. Third, perhaps you could re-contact the source and explain to him how the difficulties and potential problems relating his story "as is" in your book might engender, and probe him for either some details which could be confirmed in some other way, independently, or if his story is real, couldn't he supply at least a couple other names you could talk to about the source's reliability (or lack thereof) or some elements of the story "you've heard" but without naming the source to secondary sources. If that advice doesn't seem practical or worth attempting, then you're kind of stuck, and would probably be better off both not dwelling on it further or putting it in your book if you can't get any kind of reliable second source or other means of verification. It may be intriguing, and "very, very weird," but don't assume that due to the source's demeanor and voice tone changing that he's necessarily lying -- the story might be viscerally unpleasant to him (or her) also, and account for his emotion in relating it to you. There's no telling, either way, based on your account here, so it might be best to go with your intuition, or gut, in considering your decision or potential next move, if any. Weird stuff. Finding someone who knows the source is a problem. I know someone who knows of the source, but has never met or had any interaction with the person, so no real knowledge of the source's reliability. Interesting comment about asking the source to submit to a polygraph test. I guess I didn't mention that this person's information on this particular topic was second-hand, so a test would be pointless. Sorry for not making that point in the original post; it is an important detail! I know of whom you speak. He tells it like it is and would not tell a tale but he does tend to diverge on tangents not specifically related to what you were previously discussing. That is his nature as memories rise up from the many years past. I can tell you more privately.